Lipid bilayer membranes are among the most ubiquitous structures in the living world, with intricate structural features and a multitude of biological functions. 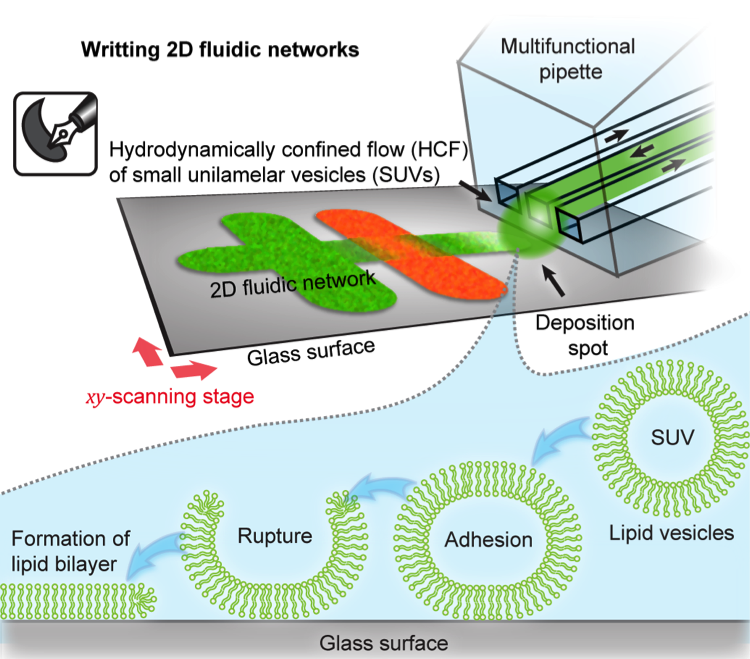 It is attractive to recreate these structures in the laboratory, as this allows mimicking and studying the properties of biomembranes and their constituents, speciﬁcally exploiting the intrinsic two-dimensional ﬂuidity. The BioPen (formerly the Multifunctional pipette) was used as a rapid prototyping technology for two-dimensional ﬂuidic platforms, based on in-situ generated circuits of phospholipid ﬁlms, by deposition and fusion of small unilamellar vesicles of varying compositions. 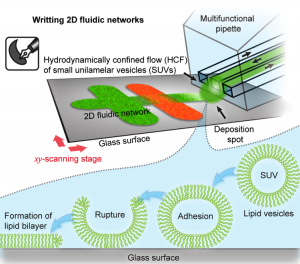 In this “lab-on-a-biomembrane”, various chemical and physical operations, such as writing, erasing, functionalization, and molecular transport, could be applied to user-deﬁned regions of a membrane circuit. The BioPen system operates in an “open volume”, i.e., outside the confinement imposed by channels and chambers, providing unique opportunities for interaction with biological samples.